Bajaj Auto aims to complete the rollout of its quadricycle ‘Qute’ in 22 states by April end for which the company has secured the approvals from these states. “We have already launched the Qute in four states – Kerala, Gujarat, Rajasthan and Bhubaneswar in Odisha. 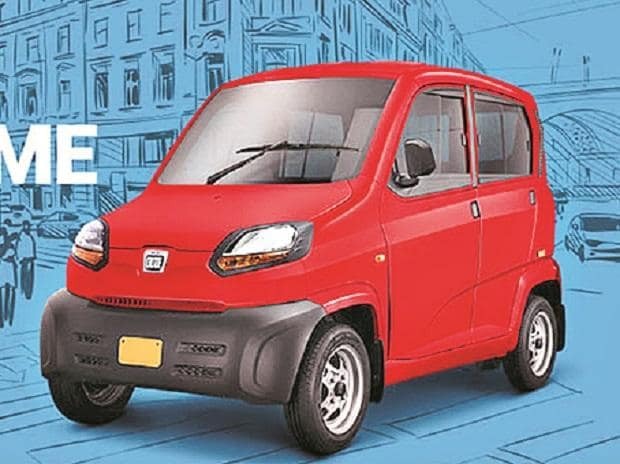 We aim to roll out Qute in about 22 states by end of April this year”, said Prashant R Ahir, deputy general manager (intracity business) of Bajaj Auto Ltd.
Ahir was in Bhubaneswar to announce the launch of Qute in the state. The launch of Qute comes in line with the acceptance of the quadricycle as a new category from the Odisha government. The auto major has created a capacity of 60,000 units per year for Qute at its manufacturing facility in Aurangabad. It is already exporting the vehicle to over 30 countries across Asia, Africa, Latin America and Europe. The company has invested Rs 700 crore as capital expenditure for production of the new category vehicle. Bajaj Auto feels that its key markets for the quadricycle - Sri Lanka, Bangladesh, Iraq and Iran - will take time to open up. The quadricycle is a new category in India. It is a four-wheel motor vehicle designed in response to the evolving requirements of low running cost. It is eco-friendly and a safe alternative for intracity commute having optimal size, weight and speed. Bajaj’s Qute can be used for both commercial and personal purposes. While the commercial category vehicle runs on CNG, the personal category vehicle is available in the petrol variant. The company claims that it is also the first four-wheeler specially designed for today’s intracity travel and best suited for first and last mile transportation in the city. “It has four differentiators. It is highly fuel efficient, comes with a low cost of maintenance, is easy to drive and provides all-weather protection”, he added. Qute commercial version has been launched at a price of Rs 2,87,722, while the petrol version is priced at Rs 257,291 (ex-showroom –Odisha). The new category claims higher fuel efficiency of 43 km/kg for the CNG variant and 35 km/l for the petrol variant.